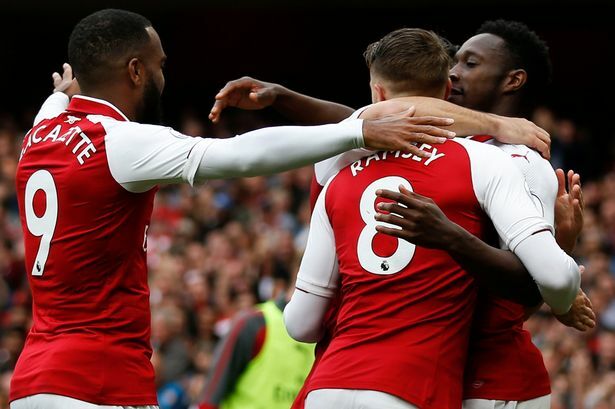 Arsenal returned to winning ways in comprehensive fashion, thumping Bournemouth by three goals – and it could well have been more. Caution must be applied to any Gooners who think recovery is now complete, but we can at least find solace in the fact that a win has been achieved, we are again looking threatening – and we have a left sided player on the left once again! Arsene Wenger chose Sead Kolasinac on the left, and the Bosnian was instrumental in our first half showing, setting up the opener for Welbeck and rampaging on the flank to great effect. Hector Bellerin on the right also showed some signs that his form is on the up. Our midfield too, kept tabs on the Cherries midfield runner, with Aaron Ramsey often being the deepest of the midfield duo, as Xhaka stretched his limbs with some great passing. It was the Welshman’s discipline though, that was most pleasing. We will need every ounce of that when we play our next Premier League fixture – next weekend at Chelsea. We were two goals up by half-time. Danny Welbeck, picked ahead of the returning Alexis, nodded us in front early on, a deft header coming from an incisive cross from Kolasinac. Chances came and went for us, with Ozil testing Asmir Begovic with a great free-kick, but we would have to wait until around the half hour mark before we made it two. Mesut Ozil was deep once again, and his foraging ball along the turf found Alexandre Lacazette, who passed to Welbeck, who immediately returned the favour. Lacazette teed himself up, before lashing a high finish over Begovic. Bournemouth were trying, but lax in defence. They did have a good chance though, but Jermain Defoe could only head onto the post. We would make them pay for their profligacy. The second half saw a similar pattern. Arsenal pushing Bournemouth back into their half as we sniffed for goals, and when the Cherries got ideas above their station, we hounded their men until the ball was retrieved. We can still improve our attack, but we did look a far better outfit that in recent weeks. Seven minutes after half time, we had our third, as Aaron Ramsey found Welbeck, who finished well into the far post area from an acute angle. It could – and possibly should – have been five or six goals, but let us not look a gift horse in the mouth. We played well, we scored a few goals, and we kept a clean sheet. This was exactly what the doctor ordered, and hopefully the confidence is flowing on the eve of a massive London derby next weekend. Lacazette is looking like the lethal striker who banged in plenty in Ligue Un, Danny Welbeck has already beaten his last season’s total of goals, and our defence is finally settled. With Alexis looking likely to return in the next game, we have plenty to worry the Blues. Can the Chilean wonder come straight back into the side with Welbeck playing so well? Will Ozil do what he did to Chelsea last season in our 3-0 win? Can Kolasinac run his own brand of rulie on the left as he has done so far? So many questions, but for now, let us just enjoy a tranquil few days after what has been an incredibly turbulent few weeks. It is the calm after the storm, let us all hope we have weathered the worst of it.